Monticello residents created a video portrait of their town by capturing video of people and places, and interviewing people about Monticello. Illinois Public Media edited the footage and interviews together to create the program. Many thanks to the more than 70 residents of Monticello who helped in big and small ways to create "We Are Monticello," the first program in the We Are... series. Whether you picked up a camera for the first time and bravely stepped forward to videotape your story, helped promote tune-in, found a photo, recruited someone to participate or were a business underwriter: THANK YOU! It was a pleasure getting to know you so much more deeply as a result of these intense three months together. We look forward to continuing the relationship. And if you haven't seen the show, you can watch it here. You can also checkout a DVD copy from the Allerton Public Library District very soon. I'm dropping off copies later this week. Side note: We captured the footage above immediately after the sneak preview we hosted for the videographers... and we think they liked what they saw. We hope you'll tune in this Thursday, December 5, at 7 PM, and lend your support to WILL-TV - we'd love to make more of these programs. Using Facebook or Twitter while you watch, like so many people do these days? Make sure you use the hashtag #WeAreMonticello so we can have a conversation that night. Thanks... and we hope to hear from you Thursday night! Brian Fulton said he gained a new realization of the strong bonds in his community after hearing residents of his hometown brainstorm ideas for Illinois Public Media’s We Are … Monticello video project. “I think it taught me that a lot of people really love our community and there are many reasons to love our community,” he said. Fulton jumped in enthusiastically to participate in the project, using the video camera he’d previously used to film his kids soccer games. The work of the volunteer storytellers and videographers, who were all Monticello residents, culminated in a video portrait of the town, edited together by Illinois Public Media. The program will air on WILL-TV at 7 pm Thursday, Dec. 5. Fulton shot video for a story about Allerton Park volunteers as well as stories about neighborhoods in Monticello and an effort at White Heath Elementary School to raise funds for the family of a second grader with leukemia. Other stories among the 21 in the video include the Monticello High School marching band and the school’s Sages mascot, and Callie McFarland’s portrait of downtown businesses including Filippo’s Pizza and Italian Food, The Steeple Gallery, and Jordan’s Barber Shop. “If I ever want to hear what other people are talking about, I go to Barber Bruce,” said McFarland, director of community development for the City of Monticello. It's nearly 9pm on Saturday night and I am here, at WILL, listening to your stories about your town, the ones you told us on September 28th, 2013. I'm creating the scripts for our editors -- Henry, Geo and Jeff -- from the footage you videotaped, the photos you gathered and the interviews we conducted with 22 of you at the high school. I’m learning a lot from you. I don’t mind being here. It’s fun to hear your passion, to listen to your stories, and to decide what to keep and what to leave out to craft a good story. The script is created from a simple formula: we start with you telling us your name and the story you selected and we end with your reasons for living in, staying in or returning to Monticello. Everything in the middle is about something you told us was unique or special about your town. Hope Wolfe of Wolfe Orchard grows and sells heirloom apples and some of those apples date back to Roman times. 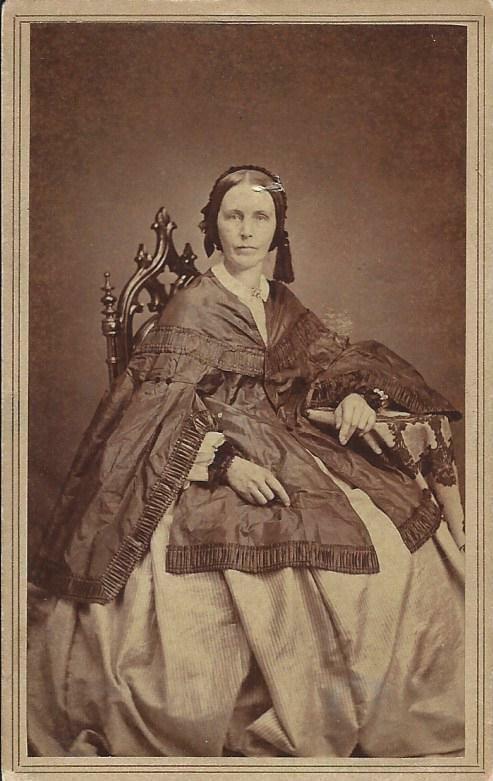 According to Kathleen Piatt, whose story is about local history, Clarinda Marquiss (pictured above), an early resident of Monticello, rode on horseback at age 17 from Monticello to the Vermilion County Courthouse to lay claim to some land. The woodlands at Allerton Park have been run as an open park free to the public since 1946! Faith in Action volunteers construct wheelchair ramps for people who need them. So far, 55 people have needed them this year. There’s tons more to share but I’m going to keep most of it as a surprise and instead encourage you to watch “We Are Monticello” at 7pm on Thursday, December 5th. 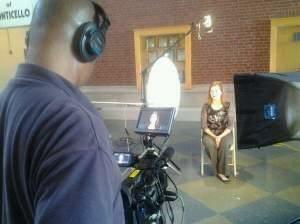 Tune in to see what your friends and neighbors told us about Monticello! There are lots of really wonderful historical photos all the storytellers and videographers gave us for the stories that make up the We Are ... Monticello tv special for WILL-TV. One of our favorites is about the Monticello Marching Sages. They gave us a few photos that won't fit in a frame for the show, but we wish we could use it! Throw back Thursday! 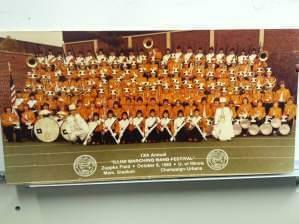 Here's the band in 1983. Illinois Public Media followed up with photographer Matt Rubel after his gorgeous photo essay featuring Monticello farmers, "Breathtaking Tribute to a Fallen Farmer" ran on Modern Farmer magazine's website a few weeks ago. Rubel narrates his photos in this slideshow. Honoring A Fallen Farmer from Illinois Public Media on Vimeo. 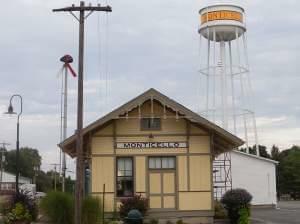 Residents know this already, but Monticello is an exceptional community. We're privileged to be working with you on We Are Monticello! You were all ready for your close ups! In the wee hours of the morning (well, around 6:00, which is really early for me), Kimberlie, Henry and I packed up and left Urbana for Monticello to film interviews with storytellers for We Are … Monticello. I was excited leaving the station, not knowing exactly what to expect but was immediately put at ease when we arrived at the high school and met with Art Sievers, who also got up early on a Saturday, to come let us in to set up. After the warm receptions we’ve had at both community meetings, I was not surprised to find that talking with all you storytellers was really a lovely way to spend a Saturday. Learning more about the history of Monticello, the businesses and all the things that make it such a tight knit and vibrant community was wonderful. I hope that all of you reading, especially those of you who worked to gather video and came to talk with us on Saturday, are as excited for the finished product as we are. Kimberlie commented on the way home how incredible it was to hear from Aubrey Brown, a junior at Monticello High School, about the value students place on academics while still finding time to be dedicated athletes, artists and musicians. We were struck by what a caring community Monticello is; so many people told us about the town’s helpers. We really enjoyed hearing about times when you’ve taken care of your neighbors. One thing is for sure, in the final version of We Are … Monticello on WILL-TV, you’ll learn some interesting history. And while a few of the stories could make you cry, many more will inspire you. They’re already inspiring us. I hope to see you all at the screening! You can follow the production process until then by searching #wearemonticello on Twitter. PS - As a former high school band devotee, I thoroughly enjoyed talking with Alison Allender, the high school band director about the rich marching band tradition and want to thank her and the students involved with the competition on Saturday for working around us. And a special shout out goes to Terri Norman at Main Street Pub for bringing us lunch! Illinois Public Media staff had a great time meeting with just over 20 of Monticello's storytellers at the Monticello High School Library last Thursday. 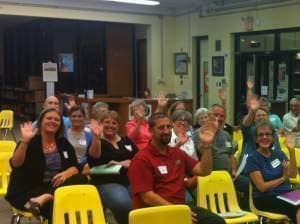 These folks are intent on capturing their town's most interesting stories with a little help from their friends - us! IPM's Director of Community Content and Engagement Director, Kimberlie Kranich, gave a thorough overview of the project and the storytellers' role (capture footage, perform interviews, BE interviewed). Producer Lindsey Moon matched upstory ideas with storytellers, and videographer/editor Henry Radcliffe talked to participants about how to use the cameras we're providing for folks who don't have easy access to one. Marketing and other development staff were also in attendance to provide support and help with brainstorming. I think everyone left the meeting that night completely excited by the diverse array of storiess that Monticelloans told us they have to tell. How will the videography go? What kind of footage will people capture? We don't know, but we're excited to find out. Participants will be meeting with IPM staff again at Monticello High School on Saturday, September 28, to be interviewed about their footage - and this is where IPM's work really begins. All the collected footage will be edited by Henry into short (2.5 - 3 minutes) videos talking about an aspect of Monticello life that people outside the area might not be familiar with. How did the school mascot get its unusual name? Is it just corn and beans being farmed in the area... or is there something else? What's REALLY going on in Monticello? IPM will put all the videos together into a program that'll air on WILL-TV in early December... that's when all of us can find out.